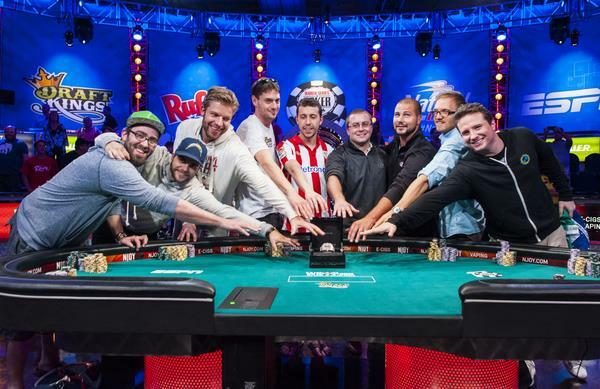 As of 8pm (ET) November 10th, the 2014 World Series of Poker final table will resume play with the winner taking home a stunning $10 million windfall. The biggest annual tournament in poker is being held, as ever, in the US gambling Mecca that is Las Vegas. The remaining participants – a collective now referred to as the November Nine – have been patiently waiting for four months since making the final table, and you can track their progress to riches live on ESPN as they battle for the crown of WSOP No Limit Champion. Reaching the final table of this esteemed tournament is no mean feat with a field regularly exceeding 6,000. Following Chris Moneymaker’s fairtyale win in 2003, the field tripled from 839 that year to 2,576 in 2004. From here it boomed right up to a peak of 8,773 people but over the last half a decade has consistently average around the 6,500. Remaining in the running until there are just nine people therefore requires patience, persistence, a huge amount of skill, and maybe a bit of luck along the way. This year’s grand prize of $10 million is the first time the bounty has ever reached eight figures, making it one of the most exciting final tables to date. The November Nine are a mixture of familiar names, online sharks and one that can only be described as a wildcard. Starting with the bookies’ favourite and working through the odds, here’s a quick rundown of the nine competitor’s going into the climax of the competition. For those of you that follow the online poker scene, van Hoof will already be well known to you after one of the sickest calls you’re ever likely to see in a major tournament. Under the alias of ‘TheCleaner11’, the Dutchman made a complete soul read on fellow pro Dylan Linde and called with just 8-high on a 4-3-5-5-4 board. There were only a handful of hands that he could be beating, and all would involve a deuce and a second card lower than an 8 but excluding 4s, 5s and 6s. Incredibly his read was spot on and when he called the pot size bet on the river, Linde flipped over pocket deuces leaving the cleaner to clean up. But his credentials stretch far beyond a simple hero call. With over 38 million in chips van Hoof is the chip leader going into the final furlong. This will certainly allow van Hoof an edge, and it is understandable that he is viewed as the favourite to win the coveted bracelet. Although van Hoof is the chip leader it is not a commanding lead, with Stephenson just a few million behind. Ironically the Norwegian almost gave this year’s WSOP a miss, and only entered after picking up around $60,000 backing the Netherlands to beat Australia 3-2 at the World Cup in Brazil. At that moment he packed up his things and headed on over to take part in the prestigious tournament, a decision he no doubt now rates among his most important ever. This time, though, he’ll be hoping the Dutch don’t come out on top again. As van hoof and Stephenson are nervously eyeing each other in the build up to taking their seats, it’s possible Mark Newhouse will be sitting back with a wry smile, puffing on a fine Cuban cigar in a pair of flip-flops and Hawaiian shirt. He is, after all, the only one to have been there and done that all before – as recently as last year. Yes, this is Newhouse’s second main event final table in as many years, which is an incredible achievement when you think about the size of the field. Last time out Newhouse was the first to fall, finishing in ninth in what he described as an emotionally draining experience. This year, expect that experience to help him get off to a strong start – perhaps stealing a few pots early on as the others get settled – and potentially overtake the leaders for the win. The fact that Jacobson has the second smallest chip stack yet maintains relatively short odds speaks volumes about the bookies’ confidence in the bespectacled Swede. He is the leading tournament earner of the November Nine with $5.5 million accumulated to date and will be exercising that familiar final table confidence that has served him so well in the past. Certainly one to watch. The youngest player still in the tournament, Larrabe will stand out not only for his tactical nous but his Athletic Bilbao shirt. The proud Spaniard will be representing his home colours as he eclipses his current career earnings, which have yet to hit six figures, and he will be hoping to make a mark on a strong table. Sindelar is regarded by some as one of the favourites to walk away from the WSOP final as champion despite a seemingly average stack of just over 21 million chips. Since 2008 he has cashed in WSOP events 17 times, but has failed to make a single final table. Having moved to Las Vegas to pursue his poker career, it is clear that Sindelar takes his game very seriously. Everybody loves an underdog. The bane of commentators everywhere, Pappaconstantinou is an amateur player that has found himself just a few places away from a historic victory. During the four month hiatus preceding the final table the Greek captured a foosball championship. He exclusively hones his skill in live poker, preferring that to an online game, and is also a dealer at Rockingham Park. It will take a momentous effort to beat the other eight competitors but, as Chris Moneymaker proved in 2003, anything is possible. Tonking will be thrilled to have made the November Nine having come some close to elimination as the bubble loomed large. Facing off against Jacobson, Tonking flopped the stone cold nuts, holding J-9 on a 10-8-7 flop. He managed to get it all in but Jacobson flipped over a flush, leaving Tonking to sweat two more cards as the crowd vied for his elimination. He survived, and will be looking to build on his 15 million chip stack. The short stacked Brazilian has become somewhat of a star in South America, so much so that a documentary is being made about his journey since qualifying for the November Nine four months ago. With a nation behind him and the shortest stack in play, expect plenty of support and a lively showing from Brazil’s new golden boy. The National Football League has successfully had a temporary injunction placed on New Jersey’s ability to offer sportsbook gambling at Monmouth Park Racetrack. Judge Michael Shipp approved the injunction after hearing from NFL lawyers who will now have to decide firmly upon which grounds they want the ban to be upheld- but this may prove tricky. For many years now the NFL has largely opposed the expansion of sports gambling. Among the fundamental reasons is the fact that they want to avoid any kind of match-fixing as much as possible; fans need only look to the 2007 NBA scandal to see the irreparable damage it can do to a sport. There is therefore a logical root to their argument, but with stars like Jay Cutler taking in around $18.5 million per year it is hard to imagine that cheating would be as tempting as it may have been back when wages were much more reasonable. With sports betting becoming as widespread and integral as it is to nearly every leading sport worldwide – not to mention the fact that many people already bet on NFL through various avenues – many fans feel that the NFL should get with the times. One of the largest stumbling blocks that the NFL is set to face involves fantasy football betting. Whilst outright match betting goes against the NFL’s agenda they openly endorse fantasy football games. Fans pick out their own dream team using a set budget and accumulate points all season for passes, interceptions, touchdowns, safeties and so on. The best performing teams will earn the players prizes and fantasy football has proven a hugely popular pastime for fans across the US. More recently, differentiating between fantasy football and traditional sports betting has become somewhat of an issue in itself. Adding daily fantasy betting to the already-existing format has resulted in a product markedly similar to sports betting. Whereas the overall aim of fantasy football is to have the best performing squad over a season-long period, daily markets allow customers to have a punt on much more short-term affairs. Having approved fantasy football, the NFL will now find it troublesome to distinguish what precisely they do and don’t approve of in legal terms. The New England Patriots have even struck up a recent partnership with DraftKings, a daily fantasy sports operator, indicating how integrated the habit has become within the game and adding further problems to the NFL’s chances of successfully quashing New Jersey’s attempts to legalise betting. DraftKings and the New England patriots are clearly heavily invested in one another. The deal ensures that the Gillette stadium will be adorned with LED-based DraftKings signs promoting regular fantasy-based updates. The team’s regular e-newsletter, which goes out to its entire fanbase, will now feature weekly fantasy football tips. The Patriots’ website and social media channels will also be flooded with DraftKings’ content. Any strict move by the NFL against short-term fantasy betting would therefore prove most problematic for this particular arrangement. According to recent documents issued on the case, the NFL’s lawyers have stated that the recent decision to relax the stringent laws are “in clear and flagrant violation of federal law – to accomplish what it unsuccessfully attempted to do three years ago: sponsor, operate, advertise, promote, license or authorize gambling on amateur and professional sports at state-licensed casinos and horse racetracks. Because this effort is no more lawful than New Jersey’s past ones, it, too, should be enjoined.” This seemingly leaves little room for negotiation, which begs the question: how exactly are they going to definitively define what constitutes illegal gambling and what is permissible via the fantasy loophole? This is not the first time such a protest has been lobbied against what many believe to be a stranglehold on the NFL’s betting regime. In 2011 a document was successful signed by voters to legalise sports gambling and the bill was approved by New Jersey Governor Chris Christie. However, the leagues sued and had the approval reversed, and when New Jersey tried to take the case to the US Supreme Court they refused to hear the case, leaving little options going forward. Yet this straightforward ideal is starkly contrasted with the fact that sports betting on the NFL is completely legal in Las Vegas. The year’s showcase event, the Super Bowl, has seen a steady year-on-year increase in the amount wagered at Las Vegas bookmakers. Browne went on to say that “a very small percentage” of viewers gamble on the games, but the figures do not exactly backup his statement. At the most recent Super Bowl in 2014, just shy of $120 million was wagered in Las Vegas as the Seattle Seahawks crushed the Denver Broncos 43-8. This is hardly an insignificant sum, so how does Browne’s claim to stop gambling in order to avoid match fixing stack up against a 9-figure betting sum on just one match? It will be interesting to see how the rest of the case will unfold, with many believing that the NFL will emerge victorious as they often do. If that proves to be the case, punters will be left to turn their habits online – or head over to Vegas.